Yesterday my train to town had door problems at Avondale station, ultimately resulting in the service being cancelled and all passengers forced to disembark and wait for the next train. 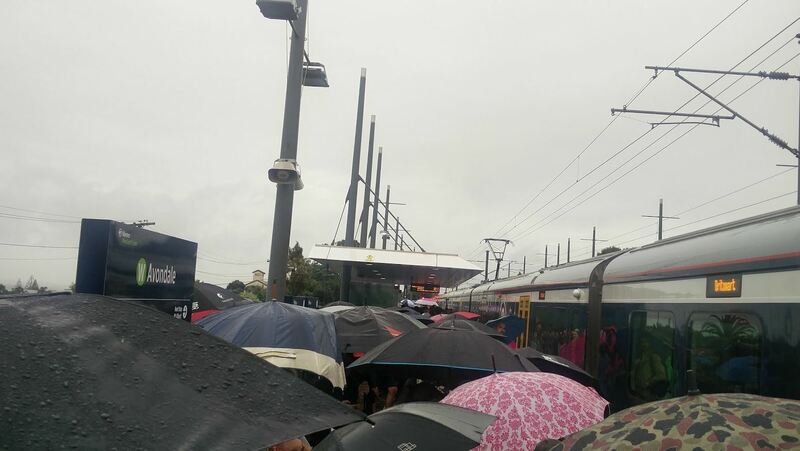 Along with all the other issues and frustration that usually go along with faults on the rail network, this episode had the added bonus of it pouring with rain as hundreds of people were kicked off. This once again highlights one of the big bugbears I have with our rail stations, an almost complete lack of shelter at most of them. This resulted in a sea of umbrellas as people tried to shield themselves from the elements. When it rains, passengers tends to huddle together under the meagre canopy. Larger canopies would also help spread passengers out along the platform. So what’s the story AT, will we ever get some decent shelter at stations? I was on the same train and aside from the enormous frustration of standing in the torrential rain without any shelter aside from an umbrella, the situation was not helped at all by Auckland Transport’s inept handling of the matter – at no stage during the whole delay was there a single update on Auckland Transport’s Twitter or Facebook page about the delays or what affected passengers should do – this was despite the fact that the delay was nearly half an hour and there was a bus stop with regular buses heading into the CBD about 100 metres away. In the end I crossed the road and caught a bus into the CBD (on perhaps the most convoluted route imaginable (bring on the new network!) and arrived at work a mere 55 minutes after I expected to. Stations like Avondale are woefully inadequate for large numbers of people and combined with Auckland Transport’s hopeless communication system, it is situations like this that cause people to lose faith in Auckland Transport (and by proxy, the Council). Once it became clear that there was an ongoing delay they should have recommended passengers disembark and get to the nearest bus stop heading into the CBD rather than standing in the pouring rain. Agreed about using the bus alternative, Sam – and with integrated ticketing there’s now no financial penalty for doing that. Totally agree. Auckland Transport have a long way to go in many things, but communicating basic information to travelers is particularly important. 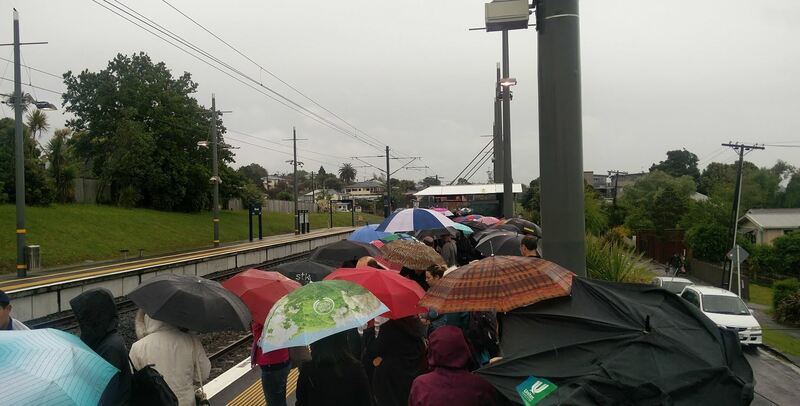 Given the terrible weekend timetable on the Western Line with trains going through on the half hour, there would have been passengers standing out in the rain for even longer. Yes boarding is hampered at the likes of say Penrose where there is both a new and old station building with a gap, people tend to stay under the one near the tag machine. I’m thinking of Kingsland where just pre-RWC the extra awnings cost a ridiculous amount, far above what any reasonable person would have thought. AT have a way of adding zero’s to infrastructure. Working around rail is more complicated H&S wise and logistically especially now the rail is electrified, which does add to significant extra costs. Time restrictions for actual time working in the rail corridor is also having large stand-down labour and machinery costs, literally paying for nothing to happen. Even getting High-rail kits installed on equipment and vehicles are a big enough costs that there is little contractor competition. Its one of the negatives of electrification and a popular rail network, however the cost benefits and overall benefits largely outweigh this. The network was not electrified then nor was it anywhere near as busy and the weekend timetables were non existent. Plus Kingsland had turnouts either end so it’s easy to divert trains away from one side of the platform or the other. It was just a rip off. Thats a very old picture, the three cars now stop at the 6 car spot meaning that only one shelter lines up with the train and anyone not going to Pukekohe has to walk further back to get out of the station. Hangover from the railway system we had before the electrification. Certainly needs work. The stations remain stuck in the 1980s with many stations having 80% of the platforms without shelter. I see that your station architects have the same fatal belief as many in Australia – the weather is always fine here, isn’t it? No it seems to be more the authorities who don’t really believe anyone actually uses the system… despite the data. I seem to recall in 2011 Transport Blog noting the then incoming CEO of Auckland Transport, David Warburton, as saying at the opening of the Baldwin Ave station that the standard Auckland station shelter was obviously too small and should be enlarged. I understand Warburton is soon to complete his stint at AT, so I guess we can use the fact that the shelters remain pitifully inadequate as a metric for measuring his commitment, or lack of it, to providing users of the Auckland rail network (and PT generally) with proper facilities and services. Billion dollar plus East-West links, anyone? Oh yeah I gonna fade away. Yeah, I was just about to comment that this post title was a missed opportunity to insert a classic rock reference. Gimme shelter Matt! I have heard that setting up gates for AT HOP cards cost around $3m a station. Good to see these on the plan and coming at some stage (have been promised for the last 3 years with no additions). $3m would get you a lot of extra shelters and happier customers. Would be great to see an AT plan for station shelters prioritised by patronage first, but taking into account stations with really poor current facilities. Can anyone get a copy of the plan? I am sure there must be one. Sorry to you at Avondale Station, but AT recently added a 2nd shelter at Ellerslie as the other one helped about 20 customers out of the 100 that are on the platform for the 3-4 busiest peak trains. It still requires a 3rd to help spread the passengers across the double units and to better serve the Southern end. Maybe this was done as it is highly visible for all the poor motorists sitting on the Southern Motorway! yes gating stations is expensive. Shelters, not so much. While gating stations is definitely something to work towards, I’m not sure it should be prioritized over more basic elements (like shelter from the weather). Can anyone explain to me why the new Panmure and the Newmarket stations have the platforms constructed open to the weather, (there are shelters) rather than under the road way cover along from the platforms and thus out of the weather? Project DART was great & we needed it, however was always in my opinion more a double 10 than a Bullseye. Is there any reason the shelter has to be so over-engineered? I’d love to see some curved sail-type canopies deployed. Yeah 25,000 volts worth of reasons. Can’t have lose canopies flapping around, you know how well loose/broken shackles, flapping stuff and Auckland electric wires mix. So gotta lock it down six ways from Sunday. And that costs money. Most of it on HSE compliance paperwork. Hell I’m even surprised we’re allowed umbrellas on the platforms given AT’s thing about helium balloons not being allowed anywhere near the stations. New Lynn has plenty of covered shelters spread almost the length of the platform. A problem occurs with the eastern end shelters in that an arriving 3 car emu going to Britomart has the driving cab stop well before the eastern two sets of shelters, If the TM is at the rear of the train then often he/she will not delay the train waiting for passengers seated on those shelters to walk back to the leading car’s doors. On more than one occasion I have seen annoyed passengers who missed the train. This issue will resolve when all trains are 6 car. Simple solution to that problem: just indicate the train length on the PID. Easy enough to deal with: just add 6 or 3 after the destination. It’s been mentioned to AT about a hundred times but, like pretty much anything else associated with passenger convenience, it’s ignored. There is currently no system to identify the length of the train or communicate that to the PID. To install an entirely entirely new system is hardly a simple solution. Not only does all or most of the platform need shelter but it should extend all the way to the street. The shelter at most Wellington stations is worse than AT’s efforts. At least an Cumberland is can be used in Auckland! can you really justify the cost of shelters, with a 10 minute timetable,complete waste of time. fair point; there is a trade-off between frequency and station amenities. The higher the former, the lower the latter needs to be. But I think that even 10 minutes in Auckland rain is enough to make a young man crumble, especially if you’re carrying bags etc. And don’t also forget some people may wait for longer so as to meet/pick-up passengers. Generally, I’d suggest that shelters seem are worthwhile investment, especially at busier stations. And it’s not just rain; the summer sun can be quite harsh too. 10 minutes is more than enough time to get soaked, plus if there are issues on the network like pictured in the article, there a lot longer wait. Also not to mention there are still trains that run at 20, 30 & 60 minute frequencies at certain times (yes there a 60, last Fri night service, Western), generally yes, off-peak there is less people, but at some stations there is still not enough space even off-peak. Hi Grant, there are significant periods of the day (off peak and weekends) where the trains do not run at ten minute frequencies – luckily the rain on Tuesday was not accompanied by gale force winds or else people would have been even more wet. Plonking tiny shelters on routes that are intended to have large numbers of passengers is very short sighted and as per usual, will be even more expensive to remedy retrospectively. Take a car. Problem solved…. Um – train delay information is the responsibility of that overpaid, don’t-care-about-the-passenger organisation called Transdev!